Brussels, 14 June 2018: The European Partnership for Energy and the Environment (EPEE) and the European Ventilation Industry Association (EVIA) are delighted to announce the timing for the next two EUREKA events. Bucharest (Romania) will be the next stopping-off point for the EUREKA roadshow on Friday 14 December 2018, following on from the inaugural EUREKA roadshow which took place in Italy last year. This will help prepare the ground for EUREKA 2019, which will take place at the College of Europe in Bruges, Belgium, on 11-12 June 2019. Launched in 2016 by EPEE and EVIA – two major European associations representing the heating, cooling and ventilation industry – the EUREKA project is a highly original concept dedicated to the role of the HVACR sector (Heating, Ventilation, Air-Conditioning & Refrigeration) for society and future generations. 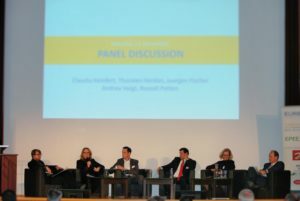 It provides a unique forum for cross-generation debates, enabling industry to continue innovating and meet even higher levels of comfort and sustainability. The first edition of EUREKA took place in The Hague in 2016 and the second in Berlin in December 2017, both of which sandwiched the roadshow event in Italy in September 2017. Stay tuned for news about other future EUREKA events around Europe! The European Partnership for Energy and the Environment (EPEE) represents the refrigeration, air-conditioning and heat pump industry in Europe. Founded in the year 2000, EPEE’s membership is composed of 48 member companies, national and international associations. EPEE member companies realize a turnover of over 30 billion Euros, employ more than 200,000 people in Europe and also create indirect employment through a vast network of small and medium-sized enterprises such as contractors who install, service and maintain equipment. EPEE member companies have manufacturing sites and research and development facilities across the EU, which innovate for the global market. As an expert association, EPEE is supporting safe, environmentally and economically viable technologies with the objective of promoting a better understanding of the sector in the EU and contributing to the development of effective European policies.